It’s Alive!…It’s Alive and Delicious! Hello and welcome to another installation of Mastication Monologues! So life in Korea has really kicked into high gear now for the month of May, and last night really signaled of fun times to come. Not only did I go out to see the Godfather of rap, Snoop Dogg, but I finally ended up in the mystical land of Hongdae. I had heard many things about this wonderful place, and after a night of fun times ending at 6 a.m., I could see why. One of the stops along the way that really caught my attention was Monster Pizza located across from the NB2 Hip Hop Club. It’s a plainly furnished place with a couple tables here and there, and you have to walk up to order your pizza. 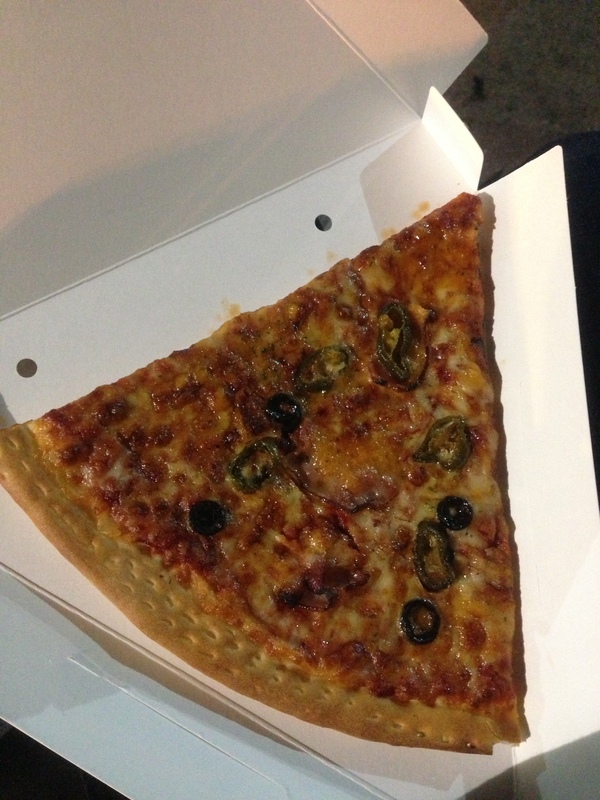 They sell pretty big slices for 3,500 Won which is a great deal for Korea when it comes to pizza. Last week I was originally contemplating trying a Dominoes pizza here, but then I saw it was 17,000 Won (16 dollars) for a medium cheese pizza. Thanks but no thanks. They only have three options: standard cheese, classic pepperoni, and the mysterious Spice Girls flavor (I don’t know if they purposely named it after the girl group or not). Naturally I was drawn to the last one, but I was also hungry. So, I opted for a slice of the Spice Girls and a slice of pepperoni. They also had packets of Parmesan cheese and a large bottle of red chili flakes on the side for self-service. 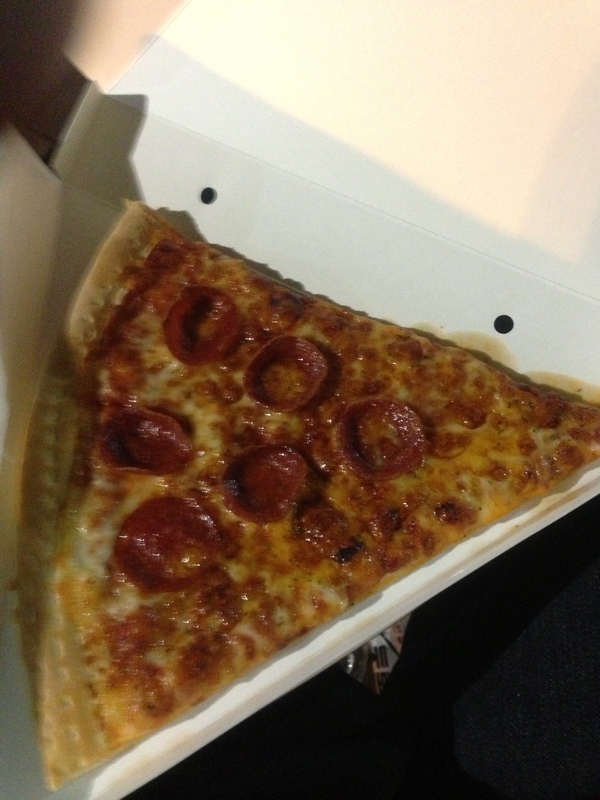 Now I was a bit skeptical looking at these slices because it seemed like some sort of trick. Normally Koreans only like pizzas if they have potato wedges, sweet potato filling, kimchi, shrimp, peppers, onions, and hotdogs etc. etc. on top and within them. They are veritable monstrosities. 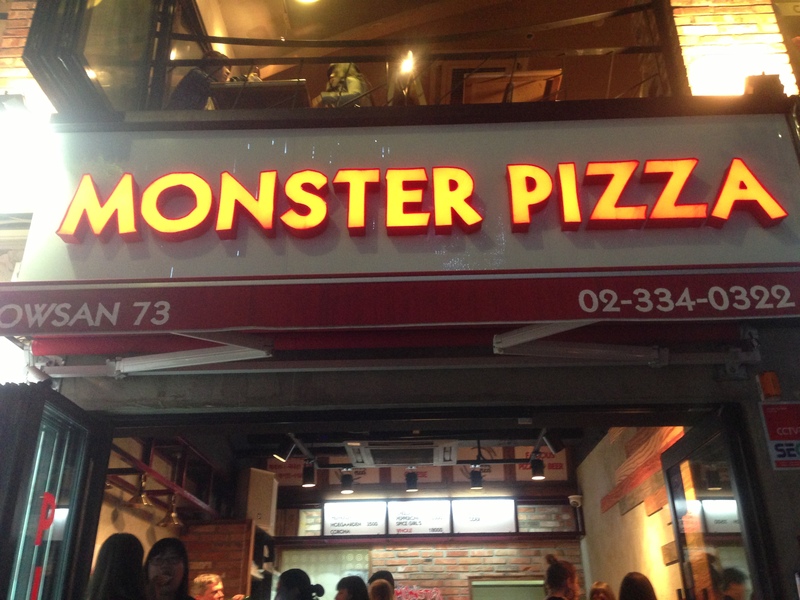 Therefore, Monster Pizza’s slices simplicity reminded me of home. I started with the Spice Girls slice which had pieces of ham, chopped black olives, and pieces of jalapenos on top of the slice. As soon as I bit into the slightly crispy yet squishy crust, cheese, and marinara sauce, I felt like I was almost eating a piece of pizza back home in Chicago. The only difference was that I was sitting in a park watching a guy bust some very girly moves to Psy’s “Gentleman” blaring out of his boombox. Every element of the Spice Girls pizza worked in harmony to bring a taste that I have never experienced in Korea: the peppers were actually spicy; the ham was semi-seasoned and savory; and the marinara sauce was not sickeningly sweet. As for the pepperoni slice, it couldn’t really reach the heights of standard set by the Spice World pizza. It still was very good with its gooey cheese and semi-greasy red disks packed with salty, unhealthy tastiness, but the sauce seemed to have a bit more sugar in it which brought down the overall taste. 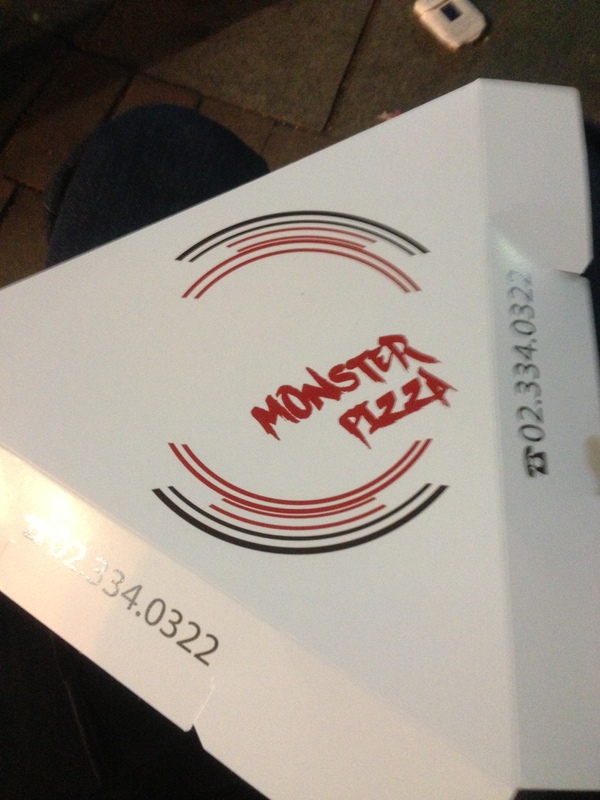 So whether you’re insanely drunk and are looking to stumble upon a food antidote to your inebriated state after a night in Hongdae or are just looking for a legitimate pizza place to try in Korea, don’t be afraid and choose Monster Pizza. 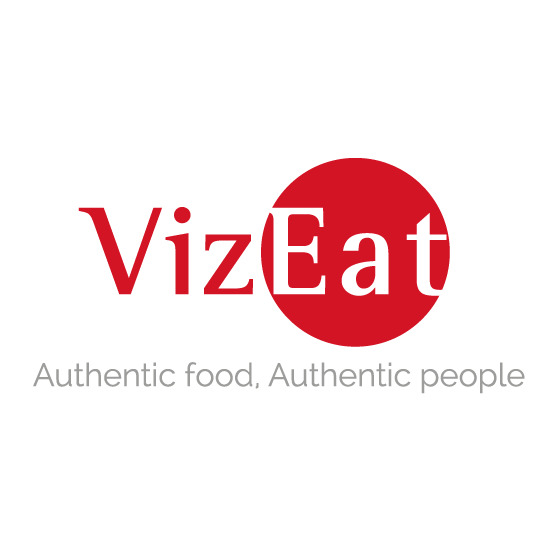 Posted in American Cuisine, Pizza and tagged authentic, bread, cheese, dining, Food, Korea, pizza, restaurant, Reviews, sauce, spicy. Bookmark the permalink. I ate two pieces of the cheese pizza here @ Monster Pizza, and it is as good if not better than most Chicago thin crust pizza I have had. The cheese is good, not too much red sauce, and the crust is soft and tastes great.